Force 5 Records, home of Underground Heavyweights; Mars, Saint Dog, Danny Diablo, Big Hoss and The Nomadz, have just added another artist that should be in your sights. 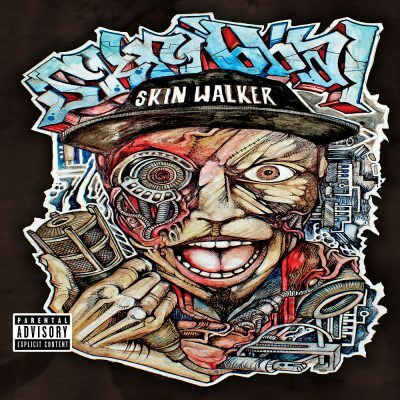 If you haven’t been introduced to Skribbal (You can read my interview with him here), his debut release “Skinwalker” is sure to catch your attention. This was another artist that immediately caught my attention and had me question how I hadn’t heard of him before. Thankfully, I had the chance to be introduced to him through the previously mentioned interview, so I thought I knew what to expect going into this new album. Let’s just say I wasn’t prepared for how much I would like it, not that I thought I wouldn’t. It just took me surprise how well it came together and I’m still very impressed. The “Skinwalker” album starts off with a shorter introduction style track that makes you think you’re being prepared for what’s coming. “Warlord X,” is a base heavy pounding track with Skribbal delivering his harden style at an agressive pace. Though the track is short and minimal, it actually does a great job as an introduction, but it was the following track, “Skinwalker,” that really caught my attention. The hook is simple, but catchy as hell. I found myself singing it more then once. The beat interlaced with the bass is unique on this one and it’s amazing how well Skribbal‘s flow brings everything together. There are a lot of great tracks on this album, as you’ll hear about, but this is the one I always found myself going back to. Skribbal also brings along a few of his Force 5 label mates, such as Mars, Chucky Chuck (of The Nomadz), Jaysin the Sin God, the DRP (of The Nomadz) and Saint Dog (of The Kottonmouth Kings). Thankfully the tracks don’t feel overloaded and it is clear this album is really about showing Skirbbal‘s skills. I personally don’t like it when it seems that nearly every track of an album has a feature. They do an excellent job of pacing out the features and it really benefits the way the whole album comes together. Jaysin the Sin God features on a track called, “Glock Talk Back,” that steers toward an aggressive street anthem and away from the horrorcore. This actually comes in at the perfect spot to give you a slightly different taste of Skribbal‘s versatility. Jaysin‘s softer voice pairs really well with the more rough sound Skribbal delivers. Overall, this track comes together really well. “Bruce Campbell,” is a dark horrorcore track through and through. I suppose there wouldn’t be a better time to feature Mars and neither artist disappoint in this haunting effort. The title really sets the tone for the hook, but the track itself is a classic throw back to horrorcore roots. Mars and Skribbal bring fire to this track and the almost nostalgic sounding beat. I can almost guarantee that we will hear some more gems with these two as they compliment each other extremely well. The whole album is a highlight really and I just wanted to make sure to at least cover a majority of the tracks. While there are definitely a fair share of albums that release all the time in the underground, “Skinwalker,” deserves a spot in any fans collection. You are literally doing yourself a disservice by not hearing this album. Skribbal delivers one of the most solid debut releases and Force 5 Records should be extremely proud of having such a powerful, talented and hungry artist on their team. I may not have mentioned every track on this album, but trust me when I say there is not a single one that should be missed. So, if Skribbal isn’t on your radar, he should be now. If you’ve heard the tracks above and like what you hear, be sure to click the purchase link below and support the real underground talent. If you’d like to know more about the man himself be sure to check our interview link above or I’ll link it below as well.